WSI Internet Marketing will be exhibiting at IFE 2012, the biggest franchise expo in Africa. The International Franchise & Entrepreneurs Expo (IFE) 2012 will be held at the Sandton Convention Centre in Johannesburg, Gauteng on 17-19 May. 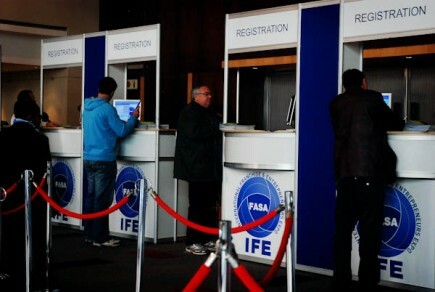 Now in its 20th year, the IFE expo is the official exhibition of the Franchise Association of Southern Africa (FASA). Over the years the show has become renowned for showcasing quality franchising opportunities for entrepreneurial-minded individuals. Franchising is also known to have higher success rates for new business owners than independent businesses. Franchising contributes 11.8% to South Africa’s GDP – more than many other sectors like agriculture and manufacturing? Franchising opportunities span 17 different business sectors, with over 500 franchised systems with a network of almost 30 000 franchisees. New business trends are the incubators of future big brands and franchising is the stone that causes the ripple effect of small business growth. Interested in owning your own business? WSI is looking to expand its growing franchise base across South Africa and to add to their existing franchises. If you are entrepreneurial and serious about business, then you cannot miss this opportunity to network with like-minded individuals who are self motivated and driven to succeed. WSI Internet Marketing is for anyone interested in a white collar franchise with a global footprint. Pop in at our stand to learn about what we do and to find about the digital marketing solutions we offer. Chat to our consultants to hear their first hand experiences and find out if you would be a good fit for owning one of our franchises. IFE 2012 is open from 10h00 to 18h00 daily with an entrance fee of R50 per person. You can find WSI at stand B10 or follow live blogging and tweets from the event. If you are visiting us do not forget to check in on Foursquare!